MacPherson. (2010). North American Free Trade agreement (NAFTA). In B. Warf (Ed. ), Encyclopedia of geography. [Online]. Thousand Oaks: Sage Publications. Available from: https://search.credoreference.com/content/topic/north_american_free_trade_agreement [Accessed 26 April 2019]. MacPherson. "North American Free Trade Agreement (NAFTA)." Encyclopedia of Geography, edited by Barney Warf, Sage Publications, 1st edition, 2010. Credo Reference, https://search.credoreference.com/content/topic/north_american_free_trade_agreement. Accessed 26 Apr. 2019. Treaty designed to eliminate trade barriers between Canada, Mexico, and the USA. The agreement was signed in 1992, and NAFTA came into effect on January 1, 1994. Some Latin American countries have also applied to join. The North American Free Trade Agreement (NAFTA) was ratified in 1994, linking Canada, Mexico, and the United States under a regime of liberalized trilateral commerce that harmonized procedures for defining rules of origin, expedited customs clearance for cross-border trade, and provided for a wide variety of institutional reforms to safeguard environmental interests and the rights of workers (sidebar agreements). The accord also included provisions to maintain stable flows of energy products, easier business travel, and reduced restrictions on foreign direct investment (FDI) across major sectors outside the energy domain (a concession to Mexico's oil industry). Despite many side agreements covering spheres such as labor conditions and environmental protection, a central goal of the accord was to achieve a phased elimination of import duties for most products and services by 2004. This goal has been achieved, though many nontariff trade barriers are still in place. A further goal was to dilute long-standing restrictions on capital mobility (FDI) and pave the way for new investment across the trilateral region. The net result over the past 15 years has been a dramatic expansion of intra-industry trade (IIT) between the three nations, with much of this IIT being conducted on an intracorporate basis. Merchandise trade within the NAFTA area is now more than 70% IIT in nature. For example, Ford USA can import components or final assemblies on a duty-free basis from its subsidiaries located in Canada or Mexico—provided that such inputs qualify as 50% North American (i.e., “local content”). Automotive companies from outside NAFTA can also compete on the same basis, provided that 50% NAFTA content can be demonstrated. Since 1994, IIT within the trilateral partnership has witnessed explosive growth. Transnational corporations headquartered outside the NAFTA zone have played an important role too, especially in sectors such as automotive products, aerospace, and electronics. From the perspective of classical or traditional trade theory, the NAFTA concept made good sense in 1994. With respect to relative factor proportions (comparative advantage), Mexico was cast as labor abundant (low skills), Canada had lots of natural resources, while the United States was capital rich (with high labor skills). Linking the three economies together via free trade would theoretically allow for factor specialization, expanded output, and an aggregate rise in consumer welfare. Specialization would also promote economies of scale (increasing returns), a core tenet of new trade theory. Critics of the accord, in contrast, argued that a free trade agreement between two advanced industrial economies and a developing nation within a geographically contiguous region would spur a mass exodus of capital from north to south, as well as downward pressure on northern wages. Neither perspective appears to be entirely correct. 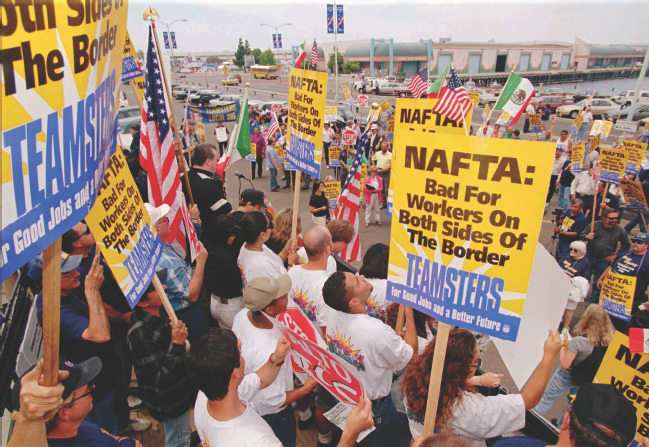 About 200 teamsters raise their signs while protesting new NAFTA trucking regulations outside the Holiday Inn in San Diego, June 18, 1996. The teamsters protested a meeting on the North American Free Trade Agreement against lifting a ban on Mexican trucks being allowed on U.S. roads and highways. The World Trade Organization (WTO) does not view bilateral or multilateral free trade agreements in a favorable light because such agreements violate core principles such as nondiscrimination and/or most-favored-nation status—principles that were developed and negotiated under several decades of painful deliberations among hundreds of nations under the General Agreement on Trade and Tariffs. The WTO was proposed as a model for free trade at the global level but tolerates regional agreements provided that they do not cause trade diversion. Thus far, there is no evidence that NAFTA has caused trade diversion to any significant degree. Trade diversion takes place when a regional free trade agreement artificially displaces a lower-cost producer from outside the club as a result of policy-driven cost advantages that accrue to in-club producers. NAFTA does not seem to be a factor in this regard, as witnessed by the massive imports from China, India, and other low-cost producers located in the newly industrializing countries of Asia and South America. Thus far, econometric modeling has failed to uncover significant evidence of trade diversion (most models are suggestive of trade expansion). Recent econometric work also points to either a zero or negligible impact of NAFTA on U.S. industrial employment. Some studies, in fact, suggest that NAFTA's tariff reductions have decelerated the pre-NAFTA trend toward employment decay in the manufacturing sectors of both Canada and the United States. Between 1994 and 2000, for example, total employment in the U.S. manufacturing sector actually increased (albeit by a modest 1%). On a less optimistic note, there is at least some evidence that trade liberalization has contributed to rising income inequality between regions for all three NAFTA members. This said, most economists and economic geographers would agree that it is hard to disentangle the trade, income, or employment effects of free trade agreements from broader factors such as capital intensification (process automation), exchange rate movements, import competition from outside the bloc, and declining industrial competitiveness (e.g., lack of investment in new technology). For example, some studies have found a negative relationship between NAFTA-assisted export growth and local employment levels. Capital intensification appears to be the key driver in this rather odd relationship. Some of these concerns might be addressed by moving toward a secure external perimeter, where the boundaries of all three nations are monitored and controlled by common standards to facilitate security compliance. This will probably not happen soon, as such a scenario would push NAFTA closer toward a customs union (which is not a politically popular option). Other concerns might be addressed by further policy harmonization, notably with regard to border management (e.g., fast-track entry for people and merchandise). Still other concerns might be dealt with by broadening the mandate of NAFTA's dispute resolution system to include issues such as illegal immigration, antiterrorism measures, and environmental compliance. Britton, J. Regional implications of North American integration: A Canadian perspective on high technology manufacturing. Regional Studies 36 : 359-374., 2002. Faber, B. Towards the spatial patterns of sectoral adjustments to trade liberalization: The case of NAFTA in Mexico. Growth and Change 38 : 567-594., 2007. Logan, J. Belted by NAFTA? A look at trade's effect on the US manufacturing belt. Regional Studies 42 : 1-13., 2008.